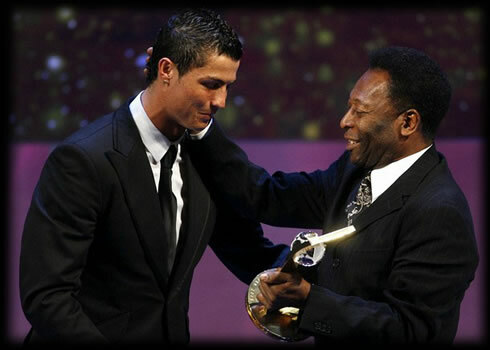 25.06.2011 » Pelé: "Messi and Cristiano Ronaldo are the best in the World for now"
Pelé joined the debate and spoke about Cristiano Ronaldo and Lionel Messi, but also left a warning note regarding Neymar's potential. The "King" said that Cristiano Ronaldo and Messi are the best in the World right now, but the Argentinian is still one level above the rest. It seems like it's turning out to be the eternal question of the modern football era. In a topic almost impossible to find a consensus, Pelé shared his thoughts on the matter and said that Lionel Messi is the best player in the World right now, overcoming Cristiano Ronaldo and Brazil's rising star Neymar. Pelé: "Messi better than Pelé? Messi is the best in the World for now, but he still needs to score at least 1283 goals more, in order to be seen as the best football player ever. There's also Cristiano Ronaldo, who has a lot of strenght and scores plenty of goals every season. He still has a lot of potential. Pelé believes that the World Best Player "fight" is exclusive to Cristiano Ronaldo and Lionel Messi, but only because Neymar is still very young. "Please don't tell me that Neymar has to be the best in the World at the age of 19, because that's just too much responsability for such a young kid. He has time to develop and become the best player in the World in future. I'm pretty sure he'll get there someday, but for now, the best players in the World are Cristiano Ronaldo and Messi. I also hope that Neymar can give his full contribute to the Brazil National Team and doesn't do the same that Messi does with his weak performances for Argentina." Pelé also said that Neymar best choice for the short-term should be accepting the challenge to play in Real Madrid, under the command of José Mourinho. "I advised Neymar to transfer to Real Madrid, but Santos President doesn't want to sell him until the 2014 World Cup." However, Maradona doesn't seem to agree with the Brazilian legend and spoke recently to the Spanish television "TVE", reffering to Neymar as a rude boy who shows no respect for anyone. "Neymar is not polite at all, a bit like Pelé. Messi in the other hand, is an exceptional player and I doubt Cristiano Ronaldo, Neymar or anyone else in the World can be better than him."